This past Friday the Italy of the Imagination creative writing class took a trip to Citta’ di Castello, a nearby Umbrian city, to see the place where manuscripts become books. 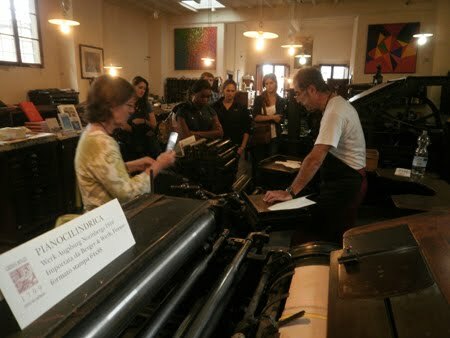 Umbra professor Cynthia Clough arranged the visit to the the Printing Museum, home of the oldest still-functioning printing presses in Europe (and likely in the whole world). Gianni Donati, a seventh-generation printer, was the students’ guide for the visit, explaining the transition from early wooden engravings to Gutenberg’s revolutionary movable type, as well as several other processes (copperplate and lithograph). Each took home several prints made with Donati’s century-and-a-half old Wittenberg press. This trip is one of a series of co-curricular trips that Umbra Institute professors use to reinforce concepts learned in the classroom.